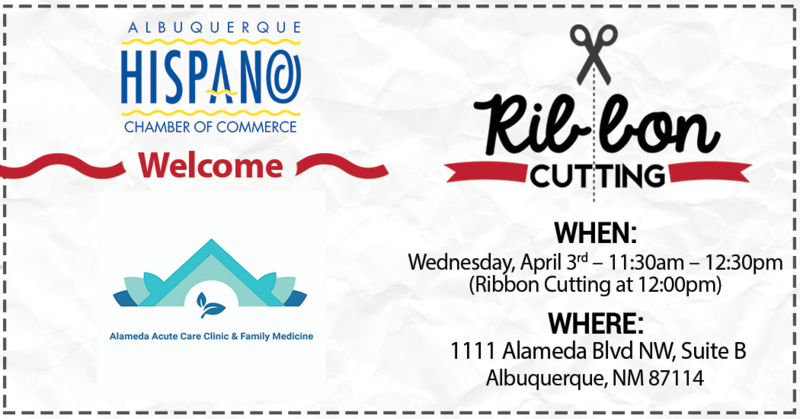 Join the Albuquerque Hispano Chamber of Commerce and the AHCC Ambassador’s Committee, in welcoming “Alameda Acute Care Clinic & Family Medicine” for their Grand Opening & Ribbon Cutting Celebration for their beautiful Westside Albuquerque location – 1111 Alameda BLVD NW, Suite B Albuquerque NM 87120 on Wednesday April 3rd from 11:30am – 12:30pm the actual ribbon cutting at approx. 12pm. Welcome to Alameda Acute Care Clinic & Family Medicine, your family practice and walk-in clinic in the West side of Albuquerque. We are board-certified medical providers who are specialized in Internal Medicine and Urgent Care. Our Services include the following, management of acute and chronic illnesses such as diabetes, high blood pressure, high cholesterol, stroke, headache, dizziness, migraine, chronic respiratory disease (asthma, COPD, emphysema, chronic bronchitis), cancer, arthritis, obesity, mental illness (depression, anxiety, PTSD), ADHD, arrhythmia, congested heart failure, bradycardia, atrial fibrillation and others. School and sports physicals, Immunizations, EKG and rapid Lab tests. In addition, we accept walk-in if you need to be seen right away. And if you simply cannot make it to the office, we also offer video visits online at www.aaccandfm.com. Please check out our website for details on how to get started. We accept most commercial insurances such as Medicare, United Healthcare, Aetna, Cigna and others. If you do not have any insurances, please check out our discounted fees for self-pay and discounted VIP membership plan which starts at $85 per month per individual and $200/per month for the whole family. Please call us if you have any further questions.